The President of the United States Donald Trump reported Monday that, according to the records of the Navy of that country, this year has ceased the harassment that American warships usually suffered in the Persian Gulf, by small Iranian gunboats. The declarations of the agent chief executive are given after his Administration announced new sanctions to the Persian country by its nuclear development. According to the reports provided by the Fifth Fleet of the US Navy, based in Bahrain, these so-called “dangerous and unprofessional” interactions that were previously occurring on a constant basis, have ceased to occur this year. After the assumption of Trump, in July 2017 the first “dangerous” approach took place under the current US administration. A warship in the United States Navy fired warning shots at an Iranian gunboat after it ignored the warning signs and approached within 150 yards. In that sense, the last “dangerous” interaction took place almost a year ago, on August 14, 2017, when an Iranian drone flew too close to an F / A-18 Hornet fighter attempting to land on the USS aircraft carrier. Nimitz, according to the US Navy. However, statistics show that during the first year of his term, such incidents were reduced by 60 percent with respect to those registered in the last year of the administration of then-President Barack Obama, in which Iranian warships harassed the US Navy about three times a month. In May, President Trump withdrew the United States from the nuclear pact with Iran ratified in 2015 by Barack Obama, in the final stretch of his second presidency. After the controversial pact with Iran, the international community began to lift, as of 2016, the sanctions that punished the Iranian economy in exchange for imposing limitations on its nuclear program. 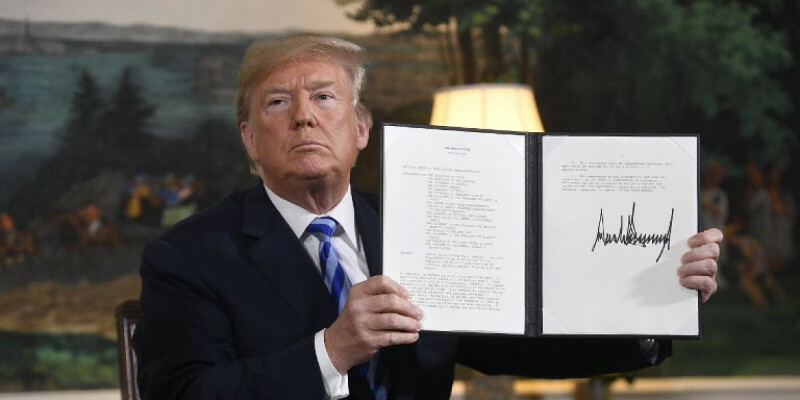 “The agreement lifted very harsh sanctions against Iran in exchange for a very weak limitation of its nuclear activity, and without any limit on other perverse behaviours, including its sinister activities in Syria, Yemen and other parts of the world,” Trump said of the agreement. signed by his predecessor. The Republican leader added that the clauses of the agreement are “totally unacceptable” because they will allow them to manufacture nuclear weapons in a short time, ABC International reported. Now Iranian authorities threaten to block the Strait of Hormuz, where 30 percent of the world’s oil enters and leaves the Persian Gulf daily, which could greatly affect relations between the two nations, warn journalists Lucas Tomlinson and Jennifer Griffin. in a FoxNews article. Iran’s reaction was caused by a senior official of the US State Department. by proclaiming that new sanctions will be imposed on the Islamic Republic in November if the Persian country does not change its behaviour. ” Our goal is to increase the pressure on the Iranian regime by reducing its income from crude sales to zero. Now, we are working to minimize the disruptions in world market supplies that may result from such measures, but we are confident that there is enough global production capacity for surplus oil, ” Brian Hook, director of policy planning at the Department of Energy, said Monday. State, according to Fox News. “In my opinion, what a US official raised when saying that the United States Iran wants to reduce Iran’s oil exports to zero, in fact, comments that I think are exaggerated and that, on a practical level, can never be implemented, “said the Iranian president who was visiting his Swiss counterpart in Bern on Tuesday. “It is really unfounded and unfair to suggest that one day all oil producing countries will be able to export oil, while Iran will not be able to do so,” Rouhani added. Esmail Kowsari, deputy commander of the Sarollah Revolutionary Guards base in the Iraqi capital, also left at the Hook crossing, assuring that “any hostile attempt by the US You will have an exorbitant cost to them, ” according to reports Bloomberg. “If you want to prevent Iran’s oil exports, we will not give permission for oil to be exported to the world through the Strait of Hormuz,” Kowsari said. The head of Iran’s Quds Force, a special operations wing of the Revolutionary Guards, also recorded that his troops in Iraq and Syria were ready to take orders. “I kiss your hand (from Rouhani) for expressing such wise and timely comments, and I am at your service to implement any policy that will serve the Islamic Republic,” Major General Qasem Soleimani announced on Wednesday. When asked a spokesman for the US Central Command responsible for the North American forces deployed in the Middle East that gave his opinion on the recent Iranian threat, declared that the American country was ready to answer it. “The United States and its partners provide and promote security and stability in the region. Together, we are ready to ensure the freedom of navigation and the free flow of commerce where international law permits, “said Captain Bill Urban. Although the United States Navy has warships in the Red Sea and in the Persian Gulf, it does not have any US aircraft carriers in the vicinity. The USS attack group Harry S. Truman is training with French forces in the Atlantic, the amphibious assault ship USS Iwo Jima with dozens of helicopters and jets, along with hundreds of marines is in the region, according to the Navy. The US initiative began to take shape late last week when Trump reported that the king of Saudi Arabia had assured him that it would increase oil production to compensate for any loss of Iranian oil in the world market. “I just spoke with King Salman of Saudi Arabia and explained that due to the turmoil and dysfunction in Iran and Venezuela, I am asking Saudi Arabia to increase oil production, maybe up to 2,000,000 barrels, to compensate for the difference … Prices on the rise! He has agreed! “, Wrote Trump in a tweet. The State Department has announced that Iran will be reintroduced next month for its automotive, gold and other metals sectors. Measures will also be taken against the energy sector in Tehran in November.